← Caramelized Onions with some very nutritious beet parathas! 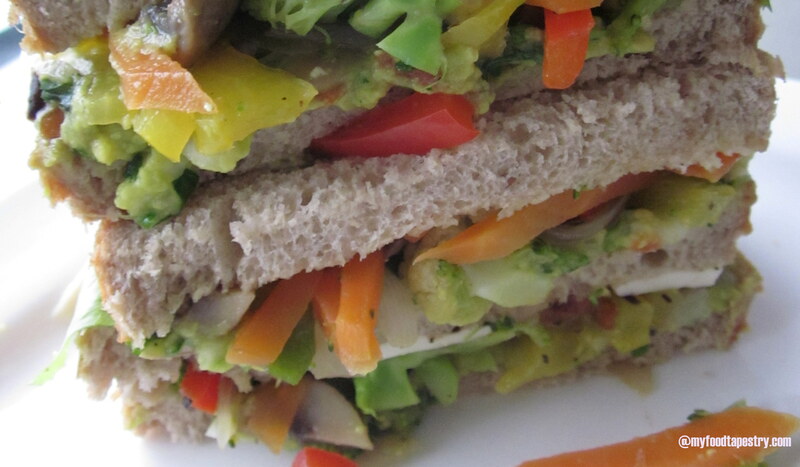 Guacamole and a very healthy – yummy sandwich! 20 years back in India, we had never even heard of a fruit called Avocado, let alone benefit from its abundant natural nutrients. But the last 10 years have changed this scenario, pretty much. Cognizance of exotic fruits and veggies is now more evident and more adaptable. Avocados are now easily available in Indian markets and are here to stay. 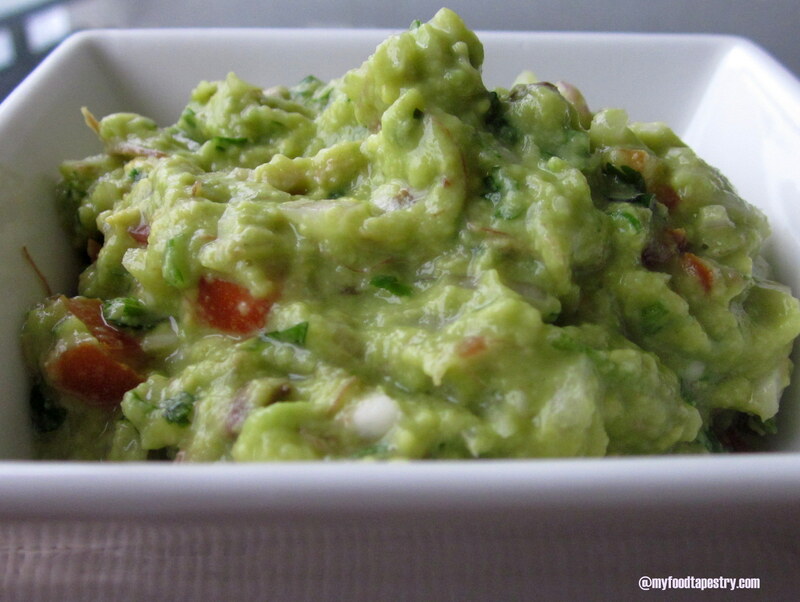 The first thing that comes to mind with the mere mention of Avocado is the very famous super creamy dip/sauce ‘Guacamole’. The dish will stun you with its flavors and texture. Inanely simple to make, the hardest part that I found was to wait for an Avocado to ripen. It takes like forever for a fresh hard green Avocado to turn nice n fleshy from the inside and brown outside. It’s a common misconception that Avocados are high in fat and calories. They are high in fat compared to many other fruits, but most of it is monosaturated fat and as such serves as an important staple in the diet of various groups where access to other fatty foods (high-fat meats and fish, dairy products, etc.) is limited. Meaning: EXCELLENT for vegetarians and vegans. Do you guys hear me? Avocados are packed with carotenoids: Avocados are a great source of lutein, a carotenoid that works as an antioxidant and helps protect against eye disease. They also contain the related carotenoids zeaxanthin, alpha-carotene and beta-carotene, as well as tocopherol (vitamin E). Avocados help lower the cholestrol. Avocados protect your heart and are great source of folate, hence excellent for pregnant mothers. Avocados can help you lose weight!! – Yes. 1/4 tsp red chili powder or cayenne pepper – optional: For the extra kick! Slice an avocado, remove the seed, spoon out the flesh into a bowl. Gently mash with the back of the spoon or a fork. I like it chunky, so I don’t overmash. But if you like yours smooth, then you could pound it well. Add lime juice, salt, green chili, garlic, onion and tomatoes. Mix well. If using cayenne or red chili powder, add it now. Mix well. Serve cold. Lime Juice: is integral to the guacamole, if you want to retain the color. Mashed avocado tends to brown and age. But with lime juice, the color stays fresh and intact. Serving Suggestions: When I make this heavenly rich sauce, the uses are myriad. as a sauce to coat your pasta, instead of a pesto or a marinara – makes one mean creamy rich yummy pasta! 3 tbsp grated cheese, I used slices. To make the veggie stir fry: In a wok, heat olive oil, saute garlic, onions. Once the onions are translucent, then add the thinly sliced veggies along with salt. The salt helps them cook faster. Stir fry on high, till almost done. Add oregano, pepper powder and chili flakes. Mix well. Keep aside. 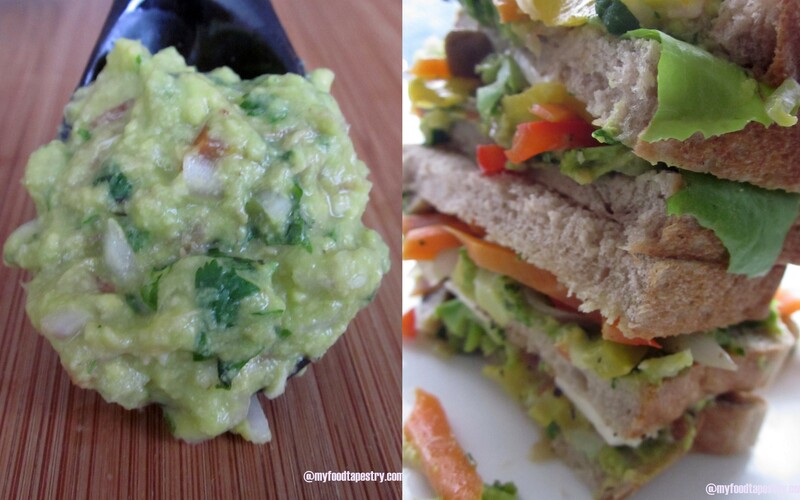 Take a slice of bread, place a lettuce leaf, dab generous amount of guacamole. Place the stir fried veggies on it. Sprinkle more chili flakes if desired. If using olives, add it now. cover with grated cheese or slice cheese. 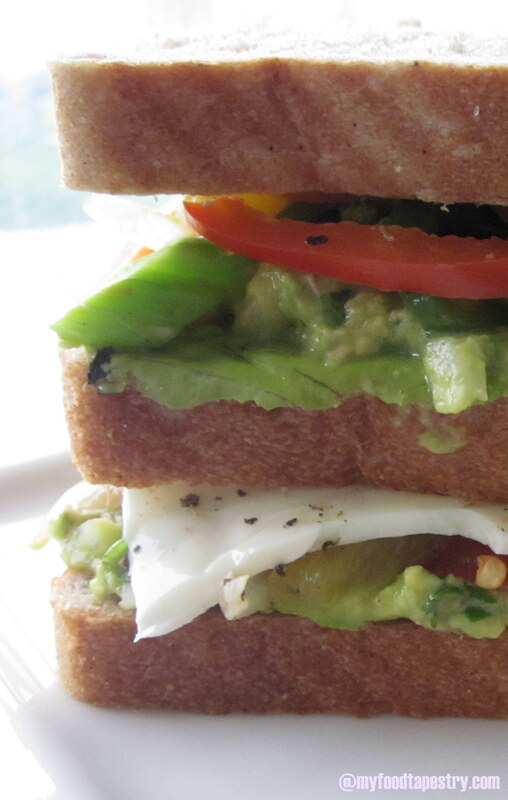 Take another slice of bread, either coat it with mayonnaise or guacamole. Place it facing down, by covering and completing the entire ensemble. Best would be to grill your sandwich using very little butter. I don’t have a griller, so I had mine as it is. Husband roasted it on a flat griddle, that tasted nice too. But grilling would be the most apt thing to do. Thats it. Serve with tomato ketchup and any hot sauce. Signing off on this note, here’s wishing dear friends and fellow Indians a very Happy Independence Day. Your sandwich looks so yumm! It is making me all hungry and drooly. 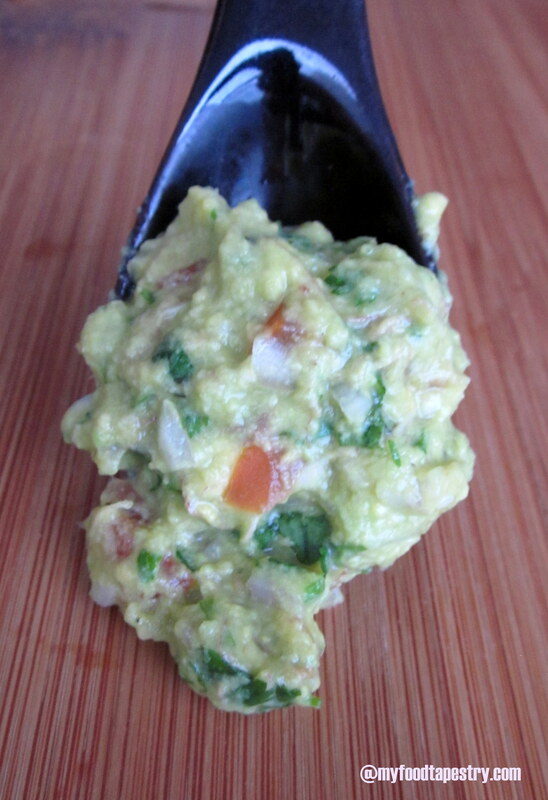 I make guacamole too, could you please share other recipes with avocados. Would appreciate it. Thank you Chaaru. I tried a salad once with avocados, it was nice n nutty. Will make it sometime n put the recipe up. Till then guacamole it is. Love love love guacamole! And it really is a pain to wait for the avocados to ripen! Yep, hardest part of the entire process. but worth the wait. Elson, I am NOT a fan of my pics. 😦 I try such permutations and combinations to get just the right pic. sometimes, I hit it but most of the times it’s a let down. But I am trying. the guacamole indeed did rock and so did the sandwich. So easy breezy to put it all together. 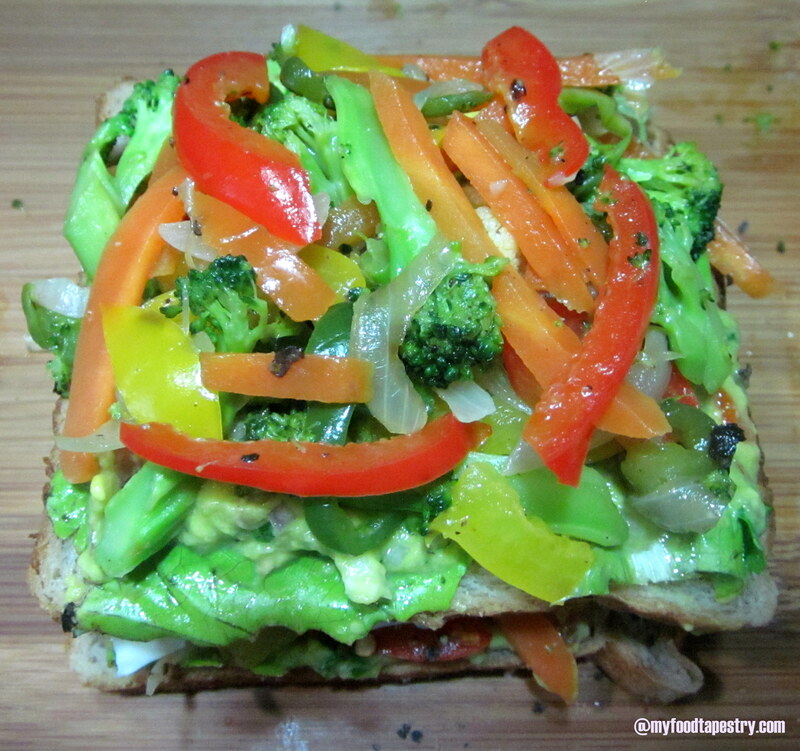 Loved the idea of sautéed veges in a sandwich. Beautiful and colorful sandwich. I love guacamole! You must try the sauteed veggies on your bread.. its divine. Namrata thanks for the awesome receipe …. Tried it today and it was awesome ….. Hubby just loved it !!!!! 🙂 Thanks Reena. Its such a delight to get messages from you. Am always smiling when I read your feedback. I just uploaded the pics of the sandwich on FB ,but of course not such a good photographer like you … But the sandwich was divine !!! !